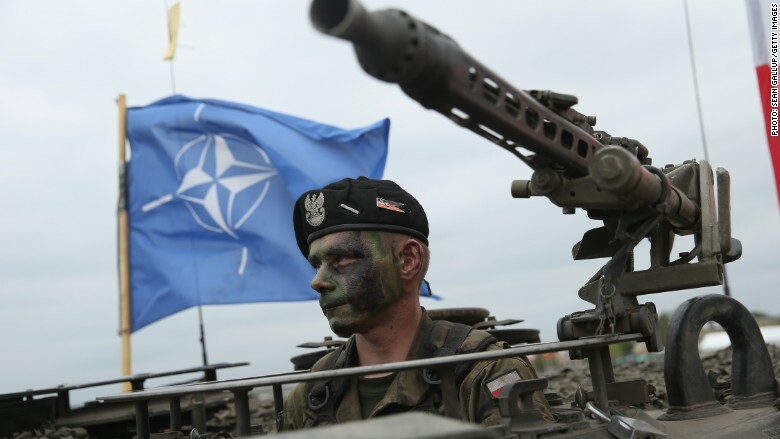 Which NATO members are falling short on military spending? A Polish soldier taking part in NATO exercises. Poland is one of only five NATO members that meets the alliance's guideline for defense spending. Most NATO countries don't pay their fair share, and it's becoming a sore point in the U.S.
Bernie Sanders and Hillary Clinton both used the Democratic presidential debate Thursday to call on other NATO members to spend more on defense. Donald Trump has gone even further, saying the U.S. should rethink its involvement in the military alliance because it costs too much money. Many European members -- including big economies like France and Germany -- spend less than the amount called for by NATO guidelines. The U.S. shells out far more money on defense than any other nation on the planet. 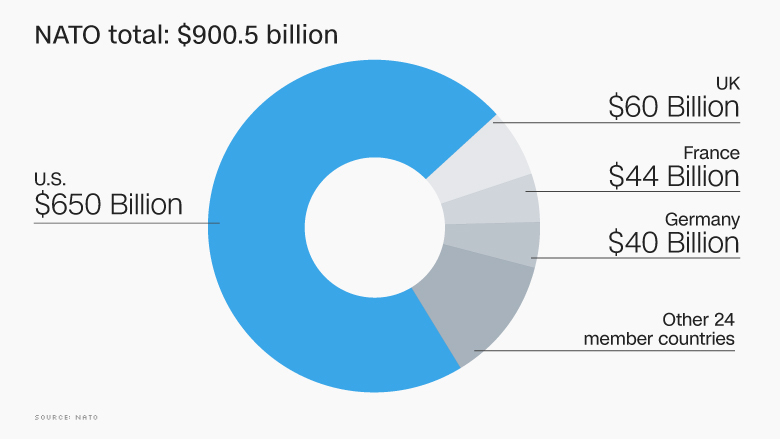 According to NATO statistics, the U.S. spent an estimated $650 billion on defense last year. That's more than double the amount all the other 27 NATO countries spent between them, even though their combined GDP tops that of the U.S.
American military spending has always eclipsed other allies' budgets since the North Atlantic Treaty Organization's founding in 1949. But the gap grew much wider when the U.S. beefed up its spending after the terrorist attacks of September 11, 2001. Even NATO itself admits it has an "over-reliance" on the U.S. for the provision of essential capabilities, including intelligence, surveillance and reconnaissance, air-to-air refueling, ballistic missile defense and airborne electronic warfare. 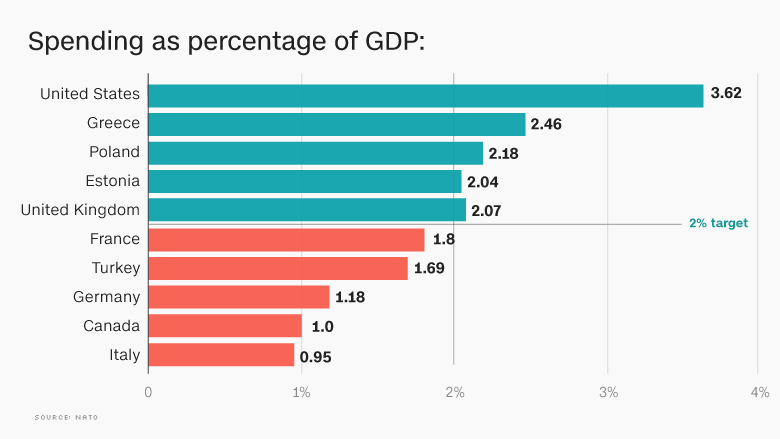 The U.S. also spends the highest proportion of its GDP on defense: 3.62%. The second biggest NATO spender in proportional terms is Greece, at 2.46%, according to NATO. The organization is based on the principle of collective defense: an attack against one or several of its members is considered as an attack against all. So far that has only been invoked once -- in response to the September 11 attacks. To make the principle work, all countries are expected to chip in. 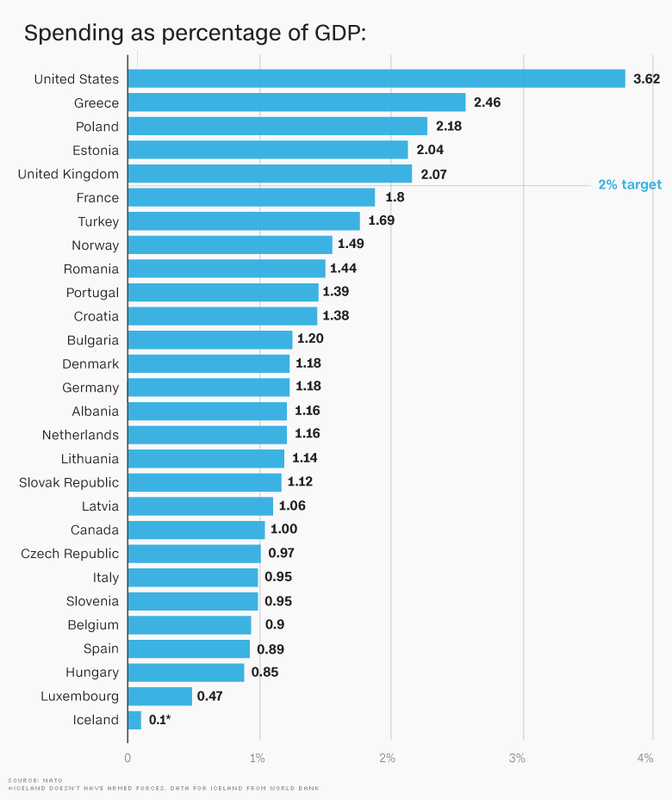 NATO's official guidelines say member states should spend at least 2% of their GDP on defense. Of the 28 countries in the alliance, only five -- the U.S., Greece, Poland, Estonia and the U.K. -- meet the target. The rest lag behind. Germany spent 1.18% of its GDP on defense last year, France forked out 1.8%. Iceland, which doesn't have its own army, spends just 0.1% of its GDP on defense, according to the Organization for Economic Co-operation and Development. Six other countries spend less than 1%, according to NATO: the Czech Republic, Italy, Slovenia, Belgium, Spain and Hungary. NATO is campaigning for the 2% guideline to be taken more seriously. At a 2014 summit in Wales, all member countries that currently fall below the threshold committed to gradually ramp up military spending to reach the target within the next decade.